Enjoy a private shore excursion from Livorno and tour Pisa, a Roman colony from the 2nd century B.C. 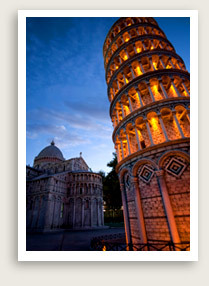 and home to the famous “leaning tower,” with an English-speaking guide. Your tour of Pisa will also take you to Campo dei Miracoli, a large, grassy piazza containing Pisa’s cathedral, the baptistery, the cemetery and Pisa’s most famous landmark, the leaning tower. You will wander around this beautiful square and enjoy the amazing architecture.